As Endeavour heads into the home stretch of pad processing before her scheduled launch on November 14, technicians and program managers continue to emphasize – through a series of Flight Readiness Reviews (FRRs) – the multiple safety and mission enhancements debuting on the fleet’s youngest Orbiter. Making a lengthy presentation before the Space Shuttle Program (SSP) FRR in late October, the Orbiter Project Office (OPO) detailed over a dozen safety improvements to Endeavour, from repositioned decals to Inertia Reels in the Flight Crews’ seats. As part of the normal post-flight and pre-flight evaluation procedures, a complete review of the Orbiter-related In Flight Anomalies (IFAs) from Endeavour’s previous mission – STS-123, and the previous program flight – STS-124 by Discovery, was brought forward to the SSP FRR. For the purposes of this FRR, only the IFAs that required modifications to the Endeavour, or pose a risk to Endeavour and her crew, were included in the FRR presentation. The first set of IFAs reviewed during the SSP FRR pertained to Endeavour’s previous flight, with the first anomaly being the DSC OL1 Card 1 Failure shortly after lift-off. “During ascent, the dedicated signal conditioner OMS left 1 (DSC-OL1) card number 1 failed, causing its dedicated measurements to fail off scale low (OSL),” notes the 82 page OPO FRR presentation, available for download on L2. After the mission, the suspect card was Removed and Replaced (R&R’ed), and the replacement was found to be in proper working order. Another IFA reviewed by the OPO was the failure of the Flash Evaporator System (FES) Pri-A controller, which, like the DSC card, failed during shortly after lift-off. Several attempts were made to restart the Pri-A controller during the mission; however, the attempts were not successful. During post-flight processing, the Pri-A controller was R&R’ed and confirmed to have a failure within the shutdown logic circuit of the IC chip – the first failure of an IC chip. Additionally, a pressure decay indication from Auxiliary Power Unit 1 (APU-1) was a topic of discussion at the readiness review. Sensors indicated a leak of approximately 4-psi/day through Flight Day-10 (FD-10) before the pressure stabilized at 228 psia on FD-14. Post-flight testing focused mainly on a Quick Disconnect (QD) poppet, the source of a similar pressure decay during Discovery’s STS-121 flight in July 2006. Testing confirmed that the suspect poppet was in fact contaminated; however, further testing at White Sands Test Facility (WSTF) proved inconclusive. Engineers believe that the leakage of Endeavour’s APU-1 on orbit was caused by a combination of low temperatures and “other seal variables,” notes the OPO FRR presentation. The last IFA reviewed from Endeavour’s previous flight pertained to the ongoing omega bend issue with the shuttle fleet’s Payload Bay radiator retract hoses. At this time, the SSP has accepted a flight rationale to fly this hose ‘as is’ for STS-126 – with the final hurdle before flight being the successful closure of Endeavour’s Payload Bay Doors at the launch pad, an option that was completed without issue last week. Also reviewed during the FRR were several IFAs from STS-124. The first such IFA pertained to the partial late release of one of the many RCS Tyvek covers. “Ground imagery showed that when thruster F3D and F4D Tyvek rain covers released, a small piece remained attached to the thruster lip,” notes the readiness review presentation. 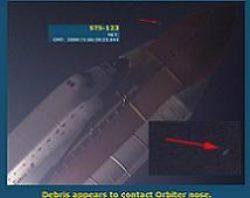 A similar event was observed on STS-118 in August 2007. As a result, the Tyvek covers were modified so that they carried the minimum thickness in the “tear initiation region.” This modification was flown on all subsequent flights to STS-118 with the first anomaly occurring on STS-124. “Analyses and impact testing were performed using a larger remnant mass size than seen on STS-118 and STS-124.” The associated risk of a late-release of a Tyvek cover has been accepted by the Program Requirements Control Board (PRCB). Thus, there is no constraint for Endeavour’s mission. Also discussed was the Rudder Speed Break (RSB) Spring Tab liberation event that occurred late in Discovery’s mission. “Micro/tactile inspection performed for STS-126 – discrepant parts (6) replaced,” notes the FRR document. Since these tabs are only used for thermal protection of the Orbiter’s RSB from plume recirculation during ascent, they are not a vital thermal protection component during reentry. 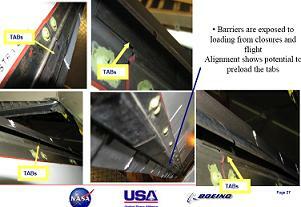 The final STS-124 IFA review slide notes an excessive Type A flow on Wing Leading Edge Tee Seal Rib Splice 10. After engineers removed the tee seal, a deterioration of the leading edge as well as a Type A glass flow were discovered. Comparable discoveries were identified on Discovery’s left wing as well. While entry heating did not exceed mission critical temperatures, and no damage to Discovery’s SiC was observed, this issue prompted a review of Endeavour’s RCC and T-seal panels. “The LESS PRT reviewed and verified the vendor lockside measurements and accepted that no similar conditions exist on the OV-105,” notes the OPO presentation. Emphasizing NASA’s continued directive of improving safety with every mission, several enhancements have been made to – or will be implemented during – Endeavour’s highly important logistics run to the International Space Station (ISS) this month. The first improvements deal with Carbon Dioxide (CO2) levels and air recirculation standards in the crew cabin. “During STS-123, crew reported symptoms of high CO2 concentrations in the shuttle airlock and middeck,” notes the readiness review document. 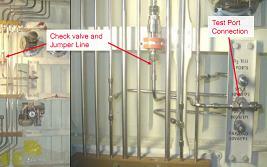 An airflow analysis was performed to determine any areas where CO2 concentrations may develop and exceed safety levels. The presentation notes that crew equipment stored in the middeck during the mission can interfere with the air circulation requirements. To this end, NASA has developed several mitigation techniques, including modified LiOH canister change out schedules, activation of airlock booster fans prior to docking with the ISS, as well as using additional middeck air registers. Another safety improvement is the D-Hatch decal relocation, a modification that was originally due to debut on Atlantis during STS-125. The relocation effort relates to difficulties experienced by the STS-124 crew in closing the upper airlock “D” hatch. The problem, which was discovered to be fleet-wide, has been corrected by placing the decals in the correct locations, and covering the misplaced decals with white tape. Another modification taken from STS-125 pertains to the Aft Window Shade revision. “At STS-125 CEIT (Crew Equipment Interface Test), crew requested elimination of additional light through previously modified window shades to facilitate sleep on the flight deck,” notes the presentation. The modification was successfully tested and adopted by the STS-126 crew. Furthermore, another modification has been made to Endeavour’s MO10W Panel O2 System number 2. The modification does not impede any oxygen flow requirements to the Advanced Crew Escape System suits or extra-vehicular mobility unit manifolds. Proper indicators and revisions to the flight procedures have been implemented to account for the bypass. The final safety modification flying on Endeavour is one that was originally scheduled to debut on STS-119 – and then advanced to STS-125 before that mission’s postponement. The modification relates to the replacement of MA-8 inertia reels in the lightweight crew seats with MA-16 inertia reels. “The MA-8 inertia reels in the lightweight seats lock only through differential acceleration of the crewmember and the seat in the forward X direction. During a low onset acceleration event, the inertia reel may allow the crewmember to become dislocated from the seatback,” notes the readiness review document. The new inertia reels will provide sufficient restraint for crewmembers in all possible acceleration directions. In addition to the interior safety modifications, two Payload Bay configuration changes have been made to Endeavour. The first configuration change relates to the removal of handrails near the Lightweight Multipurpose Experiment Support Structure Carrier (LMC). “Clearance studies showed less than 3” static clearance between LMC contingency latching pin and 1307 bulkhead handrails,” notes the OPO document. Since the LMC is non-deployable, and the handrails in question would not be accessible by the crew on-orbit, the handrails’ removal will not affect any aspect of the mission. The rails in question were removed in late October during payload installation ops at Pad-A. The second Payload Bay configuration change comes from the Multi-Purpose Logistic Module Latch Guides, which are needed to help guide on-orbit berthing operations of the MPLM at the end of Endeavour’s mission. The modification will see the installation of 22” latch guides. This change will resolve the OBSS issues while still accepting a remote failure case. In addition to the above modifications, efforts to install BRI (Boeing Reinforced Insulation) tiles around Endeavour’s landing gear doors and External Tank umbilical well doors continued during Endeavour’s flow from STS-123, improving the resiliency of the vehicle’s Thermal Protection System in critical seal areas.